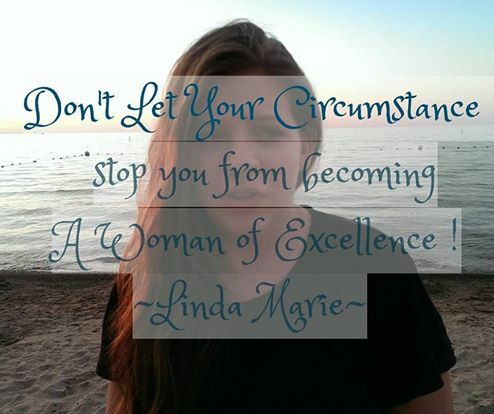 As I was studying The Word this morning and reading from a devotional I was sent, It finally dawned on me that ” Becoming A Woman of Excellence ” had nothing to do with my circumstances or what status I was born into or how many times I failed at something in life. Ruth was a widow, a foreigner and she was out gleaning the grain from fields where those who harvested , had missed some. So she was not known there only by her actions… If others watched you, would they see you as a woman of excellence ? Ruth was not of high estate or well to do ! She merely followed what the Lord had put in her heart to do , Go with and care for her mother in law Naomi. Reading the book of Ruth , I would say she was ready for a change in life… She chose adventure over remaining the same and she was a loyal friend and daughter ! She had a tender heart and was a very caring woman ! She was a woman of noble character, she was selfless in doing those things that were excellent, she was strong and did those things she found a worthy pursuit in life. I would suppose that many women would not have been so brave to follow someone to a land they had never been to… Have you ever done that ? Picked up and moved to a land (state) you have never been to ? I have… not knowing what awaited us there but following what the Lord showed us to do at the time. Excellence is measured by Success in Life for the most part today. In what we attain or what we accomplish. Many times we feel like failures in life as we don’t have the finest things, we have not made it to that position in our career, business or as a stay at home mom we feel that we have not attained some status in caring for our children , home or spouse. Something is lacking in our lives !!! Tweet: We are comparing our lives to others lives ? or even to ourselves ? For we dare not make ourselves of the number , or compare ourselves wit some that commend themselves: but they measuring themselves by themselves, and comparing themselves among themselves, are not wise. I am here to tell you that you don’t have to allow your circumstances or your current position to keep you from “Becoming a Woman of Excellence” ! Tweet: Kick those could have, should have , would have’s out the door ! Fame, Success, Materialism and Popularity are fading… Today the church has become so much like the world that its hard to tell your brothers and sisters apart from those in the world who follow after such things. Its no wonder so many find “Christians” to be hypocrites ! They see no difference in those who say they follow Christ, then they do in the world ! Becoming A Woman Of Excellence even from the first chapter is a very thought provoking study of areas that can be life changing ! I need to be totally honest with you here… though I read my bible and I take notes, I am a list person ! I have never been good at writing in a devotional or journaling, blogging or following through in some ways. But I am going to try to change that, as I wish to be an encouragement as I seek to follow the Lord and the changes he wants me to make in my own life and the life of my family. Presenting our bodies as a living sacrifice , holy acceptable unto God, which is our reasonable service. And be not conformed to this world: but be ye transformed by the renewing of your mind, that ye may prove what is that good and acceptable, and perfect, will of God. You can purchase your own copy Here ! In paperback or kindle ! I received a free copy of this devotional for my unbiased review and personal use and have received no further compensation for doing so. This entry was posted in Becoming A Woman of Excellence, Book Reviews, My Thoughts, Reviews, Serving the Lord, Women Professing Godliness, Womens Ministry and tagged acceptable, Bodies, Christians, Fame, God Fearing, Holy, hypocrites, Make a Difference, Material Girl, Material World, Materialism, mind, Mom, not conformed, perfect, perfection, Popularity, renewing your mind, Sacrifice, Success, transformed, True Worth, Wife, Will of God, Woman, Woman of Excellence, Women on July 18, 2016 by Linda Marie Finn. Sucking the Life Out of You ! ~ I am not sure about you all, but I have always tried to be a people pleaser and always help others… Sometimes, to the point that I am emotionally drained and dragged down. It wasn’t until 2015 that I finally realized there are folks who will always be an emotional drain on you and never listen to sound advice and never change their lives no matter how sick they are… I am talking physically, emotionally or mentally sick. Have you ever felt like that ? You do and do for others until your empty and you might not even have the energy for your own family that it has drained you so much… its not a good place to be. When you think family, I am talking those in your own house, not extended family outside your home. We have to focus on Us and our immediate family in our home as that is what matters at the moment. I know that is so true for me as a wife to a man with mental and physical disabilities and as a homeschooling mom of 3 who are still at home. There were days in my past where even my older kids as older teens and even as they become young adults or adults the drama and emotional damage that they can do to you , disabled me from doing my best for the Lord in my own home and it really reaps havoc on your family. Mark and I suffered a lot of emotional crap trying to raise my kids from a previous relationship. Even to the point of being investigated by CPS 4 times and found not guilty of the allegations put against us. And when it comes to “friends” those you have met, by letter, on the internet, or in person, I tended to go into each relationship 100% and thought others were the same way as I am. Time and time again, Mark would say “Lin, Human nature 101…smiling faces tell lies ” For so many years I never could see that as I was raised to be a real friend and a truthful person. So when I would help someone, send them things numerous times over a 14 year period and never see any fruit from the advise given or a changed lifestyle, you tend to wonder if what your doing is effective. When you strive to love people like the Lord wants you to and they act like you are treating them wrong, you get very discouraged at times. And if you know more folks who help the same people a lot and it seems like everyone’s love and mercy on them isn’t making them more responsible, but causing them to become dependent upon everyone, you have to re-examine what your doing…. When I started my business I had several friends doing the same business…. so I chose to sign up under someone that had friends in common with me, hoping none of your friends would feel hurt and yet I could do business along side them and if anyone wanted to know how I was succeeding , I would share my knowledge with everyone so we all learned and benefited. I love seeing others I know and love succeed ! So how much can you really help those who never change, you have watched and seen this is the reality right… With my older adult children, I don’t even like to use adult as they at times are so immature and self centered, they don’t have the qualities of adults who are mature… but with them, I learned that if I allow their drama in my home or near us, we all suffer harm emotionally and mentally. With others who are suppose to be Adults and never change as I was told at some point you burn that bridge, don’t look back and go on with your life and live without their drama and constant draining on your life…at least until they learn the lesson God is trying to teach them. Trials in life are for learning from and sometimes when we all step in the way of that, they never learn to stand on their own two feet and become dependents of whomever. ( its akin to the welfare in the US….constant handouts create an entitlement attitude at the expense of others who work hard to earn what they have.) We can only help just so much or we harm those we are trying to help by standing in Gods way to bring them to the understanding of the need to be God sufficient… God has known my heart for the last 15 years Mark and I have been married and regardless of what others think, its been in the right place and I truly meant to be a real friend. This entry was posted in Health and Wellness, My Thoughts, Serving the Lord, Women Professing Godliness, Womens Ministry and tagged #Balanced, Burning Bridges, Choosing Friendships wisely, Complaining, Drama Queen, Emotional Stress, Family, Friends, God, Godly Living, Honest, Honorable, I have tried, LiveLifeOnPurpose, Love, Real Relationships, Responsible, Stop whining, Sucking the Life Out of You, True Friendships, Truthful on April 16, 2016 by Linda Marie Finn.